What a wonderful movie! It opens on the most beautiful snowy glass ball sky, with music as sweet as the aurora borealis pumped through an MP3 player. The first half of the film swims with a rhythm that will keep your feet happy and warm despite the icy scenery. But just when you think you've caught the drift of this cute little rockin' movie, the glacier capsizes propelling our little heroes and the mood of the picture into a different, yet just as entertaining texture. It's actually a bit of shock to the system, that an animated film about penguins would have such a dramatic edge. It's a bold move to make such socially important statements in a film that would still have been just dandy remaining foot-loose and fancy-free. The music arrangement and performance and especially the interpretive melodic medley compositions are fantabulous -- chillingly sweet. The acting is solid and animation dynamic -- from cute to powerful (dramatic, occasionally dark, commanding) in 0.5 seconds. This is what going to the movies is all about -- and I don't even have kids! Take March of the Penguins, Moulin Rouge (musically speaking), "Babe" (same writer/director) and put them in a blender with shaved ice, fresh ideas, some solid messages and great animation -- it's a kid's film for adults and teens. Some Notes: Brittany Murphy, Hugh Jackman, Nicole Kidman and even Robin Williams do the singing for their respective characters. Murphy & Kidman can really sing! Interestingly enough writer/director Miller wanted to change some lyrics from Prince's "Kiss." Prince initially denied them permission, but after screening some footage from the film, he was so inspired -- he changed his mind on that and wrote an original song for the film which plays during the end credits. 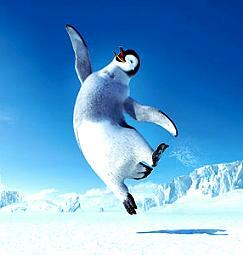 Happy Feet. Copyright © 2006. Starring the voices of Carolos Alazraqui, Lombardo Boyar, Jeff Garcia, Honny Sanchez, Robin Williams, Elijah Wood, Brittany Murphy, Hugh Jackman, Nicole Kidman, Hugo Weaving. Screenplay by George Miller, John Colle, Judy Morris, Warren Coleman. Produced by Doug Mitchell, George Miller, Biller Miller at WB/Village Roadshow.